Filling the gap between no jacket and a heavier winter jacket, running jackets are the perfect middle ground for mobility and functionality that will keep you warm through that long run. With a company whose name originates from Greek mythology as the personification of victory, Nike running jackets do not disappoint. With the production of Nike jackets and other clothing starting in 1979 these jackets are time-tested as Nike has been delivering a high-quality jacket going on 40 years. Being a best of the best list each of these jackets needed to meet certain criteria before they were even considered for inclusion. A great running jacket can be lightweight, provide warmth, allow breathability, and be windproof or waterproof couldn’t hurt. All of these features when combined will work to provide any runner with a jacket that has unparalleled performance. Knowing when to use a running jacket is equally as important as owning one. While owning one will prove to be invaluable should you make the mistake of using it when it is too warm or too cold will result in a poor experience. Many avid runners recommend warming up outside in the elements to help you determine whether or not a jacket will be needed that day. This jacket has it all and with the aesthetically pleasing clash between modern design and vintage style, it's sure to draw attention. Nike uses the lightweight polyester material to produce these works of art which is renowned for its ability to wick moisture and dry quickly. The implementation of tapered sleeves and zippers give this jacket a defined running appearance and added functionality. Your sleeves can be a primary source of heat loss and with that being contradictory to the purpose of the jacket this needed to be addressed. Nike designed this contemporary v.s. Retro jacket to use elastic cuffs that will gently grasp your wrists as you run. Often times you will start running and need a jacket only to have the sun come bursting through whatever impediment was preventing those blinding rays from reaching you and turning the temperature up. On your back near the mid-region, Nike added a zippered opening that when opened will allow excess heat to escape and cool you off. The Windrunner jacket combines the basic functionality of keeping you safe from the elements and being one of the most comforting running jackets you can find today. The unique style and incredible amenities make this jacket well worth the slightly higher than the average price tag. With the Impossibly light jacket, it’s as though Nike was intending to make one of the best night time running jackets you could find. It would be better suited for a warmer climate as the materials are very thin and wind flows through it with ease. This breathability is extremely refreshing and will keep you quite cool through your run. Running at night isn’t generally fraught with peril, however low visibility is a risk of most environments. With the use of reflective linings on the sleeves, collar, and symbolic Nike swoosh you will be clearly outlined for passing drivers which could prove to be invaluable. Almost unique amongst every other Nike jacket I reviewed was the addition of a carrying pouch. This pouch is extremely compact and has a convenient easy hold handle that will work wonders should you get a bit too toasty and need a reprieve. Considering all the tremendous benefits when choosing this jacket I was hard pressed to find any negative traits. While I did find two qualities I thought were less than ideal, as one of the lower priced jackets they are easily overlooked. The fold over elastic used on the hood and sleeves is a great addition that makes this jacket more comfortable. The cordlocks added to the hemming of this jacket make adjustments easy. The inclusion of a carrying case allows for easy on the go storage. Using reflective elements on this jacket provides extra safety. The fabric is very thin and is see through requiring additional clothing to be worn underneath. During cool weather this thin material will get breezy and can become uncomfortable over time. With a lightweight and simple design, Nike provided a minimalist construction with one purpose, effortless addition to your run. This jacket can be used during just about any run, with any outfit, and at any time with its reflective print and its elastic trim. Like other Nike running jackets, the Flash uses a rear vent to release trapped body heat. When you’re running not only is the area around you changing but you’re changing areas. People, street signs, cars, all of these things you encounter on a daily basis can equate to adverse risk should you run into one due to lack of visibility. The Shield Flash jacket has a runner-specific hood that won’t impair your vision. Likely more common than an identification card nearly everyone carries a cell phone. This waterproof coat has a larger media pocket designed specifically to safely store valuable electronics. With a brand synonymous with the performance the Shield Flash running jacket lives up to its name. This extremely simple but well-constructed jacket’s media pouch is a unique addition that provides easy access to your music. This jacket is priced about averagely compared to others on this list but superior construction gives it a superior value. The runner-specific hood keeps your visibility clear during your run. Using elastic trim keeps this jacket in the position that is comfortable for you. Rear ventilation improves the airflow of this jacket and allows trapped heat and moisture an escape. The reflective print is a unique way to add safety while remaining stylish. The hood feels to have extra bounce and can become bothersome while running. This jacket has no pockets and the lack of storage space is noticeable. As a more form-fitting and go with the flow training styled jacket this Epic Training jacket is a solid contender in the Nike line-up. 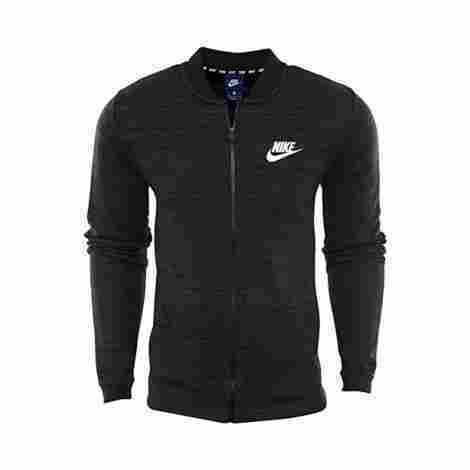 Like almost all other Nike jackets the Epic Training jacket is made of 100% polyester. This jacket has zippered pockets which add that desired extra bit of runners bounce protection. Your neck accounts for about five percent of body heat loss based on the skin surface. It also helps your brain to determine its reaction, keeping your neck warm while running on cooler days is critical. This jacket uses a mock neck that will help to insulate your neck and keep you feeling warm. With the mock neck and thicker polyester fabric, you can quickly start to feel as though you were wearing a fabric oven. Instead of using their traditional rear vent Nike opted to use mesh side panels and they work well with this jacket. The most redeeming trait of this jacket is the very low cost. With the features, this jacket includes you wouldn’t expect this kind of performance from a cheaper jacket giving it a higher than usual value. As one of the cheapest jackets on this list at the very least, it's well worth its lower price. Mesh side panels work you keep you cool and dry throughout the most vigorous runs. The extra warmth provided by the mock neck does an amazing job of retaining body heat on those cooler days. The use of a elastic hem and cuffs give this jacket a snug fit. Zippered pockets keep your running essentials in your pocket even through that runners bounce that is generated by your movements. The lack of any reflective material combined with a dark color makes this jacket a bad choice for late night runs. There is no interior lining in this jacket and when it comes in contact with water you will notice. The Overtime Warm Up jacket that Nike produced has a more traditional feel and design. Reminiscent of those older track suits this jacket the use of modern materials and safety features make this jacket anything but. For your safety Nike used contrast insets that will reflect light directly back to its origin and become glaringly visible. These insets are located on the collar, sleeves both front and back, as well as on the shoulders fully encompassing the outline of your torso. While it can generally be overlooked by many manufacturers any avid runner may have experienced the neck bite that is generally associated with turtle neck type running jackets. Nike implements a zipper guard that will prevent this bothersome pinching from occurring. As a more safety conscience jacket, the most valuable trait is the contrast insets. This small safety feature works like a charm and could save you from a terrible injury. The value is further amplified by the lower cost making this a well rounded jacket. The very large color assortment allows for a little personalization when you pick this jacket. Strategically placed reflective insets outline this jacket and works to keep you say during night time runs. Protective zipper guards keep your zipper from pinching or biting your skin during a run. With an extremely low price this jacket can be added to nearly every running setup. This is a looser fitting jacket and while running will go flap and cause the pitter pattering noise. These jackets run rather large and a smaller size might be the safer buy. With this jacket singing in the rain is going to take the back seat and running in the rain will be taking over. The flex jacket uses a four-way stretch that allows it to bend, stretch, and contort in any direction you need. 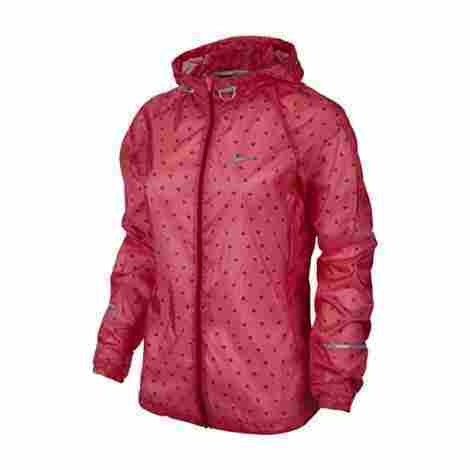 Nike added a durable water repellent coating to keep you dry should it start to rain during your run. Using a partial zippered design gives you the ability to quickly and easily air out your jacket. 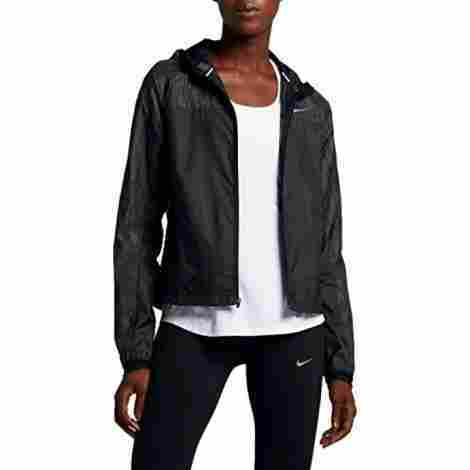 To keep this half zippered jacket from dancing in the wind Nike added a perforated gusset that allows ample air flow. Rain, sleet, hail, or snow will work to slow you down and even stop your run altogether. Combined with the perspiration you produce these jackets will inevitably come in contact with water rather frequently, Using a DWR coating this jacket will keep you dry while you’re running. This jacket has all the features associated with the top tier running jackets and more. The carrying case and DWR coating make this an excellent choice to use as a trunk jacket you can throw on should a downpour ensue. As one of the more expensive jackets on this list, the price was my only concern. Better suited for colder weather, the Nike Essential running jack does a remarkable job of keeping you warm and comfortable during those harsh winter runs. With a waterproof DWR coating and sealed stitching design snow and water will stay out and keeps you dry. We’ve all been there, breathing into our hands trying to combat arctic-like conditions with nothing more than warm breath and willpower. The higher neckline on this jacket will work to keep cold air at bay. The almost accordion-like baffle box construction used on this jacket is another way Nike went about fighting the frigid weather. These insulation filled boxes have an uncanny ability to retain heat keeping you warm on even the coldest of days. Being more of a winter protection choice this jacket is limited to use in only colder climates or during winter seasons. As far as running jackets go many winter jackets in comparison are bulky. The baffle box construction and insulated filling go a long way in keeping this jacket compact and flexible. With an average price tag, this jacket would please any runner that needs a cold weather option. 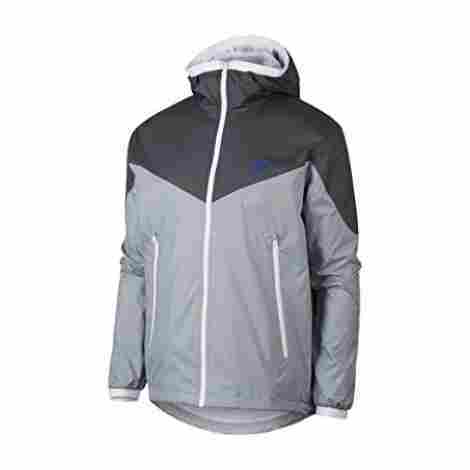 Almost perfectly suited for a cold weather run this jacket has superior insulation and is one of the most compact full winter running jackets on the market. Baffle box construction adds a layer of protection between you and the elements. Using a drop tail hem the rear of this jacket is longer than the front for added protection from kick up caused by your feet while running. The use of a media pocket ensures easy access to your music without compromising the integrity of this jacket. This jacket is very limited to colder temperatures. Personalization is non existent with this single color and it can seem bland and ordinary. This ever so stylish running jacket focuses on keeping your core warm and as a sleeveless option allows your arms full mobility while running. With the use of goose down insulation, you won’t have any issues with a cold core which should help to keep your circulatory system happy. With how well the goose down insulation can retain heat it can get quite warm inside this jacket. By targeting specific hot spots on critical points on this jacket Nike keeps the air flowing through your jacket. Located on the sides of this jacket are two front zip pockets capable of holding small running necessities. Furthermore, these pockets double down as media pockets with the use of a cord port in each pocket that your headphones can be fed through before a run. The most important and only unique aspect this jacket possesses is the cord port that can be found in either pocket. The sleeveless design uses less fabric in turn logically reduces the production cost but coming in at an average price point it's apparent that the savings aren’t passed on to the consumers. Using targeted ventilation Nike identified the areas that generate the most heat while running and added increased ventilation to those spots for a more comfortable fit. The media pocket on this jacket has a cord port that can accommodate a pair of headphones. 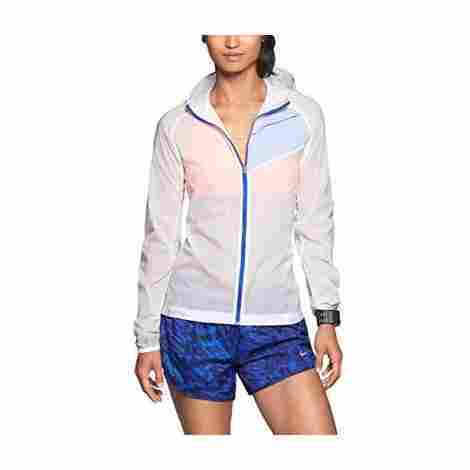 The side pockets on this jacket are zippered keeping your running essentials locked in place. This jacket is easy to maintain as it is capable of being machine washed. The higher price was a primary factor in this jackets positioning. The sleeveless design makes this jacket less effective on colder days. Out of the box thinking, was definitely used when Nike designed this running jacket. It’s made with a sheer waterproof and windproof fabric that keeps you dry and harsh winds at bay while you run. For extra breathability, Nike combines vapor tech and strategic eye holes to keep the air inside your jacket circulating. Not very uncommon but a very welcome feature is this jackets windproof construction. With normal winds reaching up to 15 mph let alone adding your running wind many jackets would struggle to keep the wind from penetrating but the vapor cyclone holds its own. Waterproof and windproof jackets come with their own specific challenges and drawbacks. The most prevalent issue is generally built up heat and moisture inside the jacket. For your comfort, Nike Added small eyelet openings that work in conjunction with the porous waterproof membrane that will allow heat and moisture to escape. The majority of the value of this jacket seems to come from the strategically placed eyelets. With a higher than average cost this jacket does seem the same task as others on this list but for a higher price. The sheer water repellent fabric is sure to keep you dry during the heaviest downpours. The eye lets added to this jacket allow trapped heat and moisture to escape without compromising the waterproof characteristics. As a windproof jacket you’re sure to have no issues from the wind on your run. With bonded seams this jacket is quite durable. There is a very limited color and style selection. The sizing on this jacket can run quite small and a larger size may be the safer purchase. This interesting jacket took a left turn in development when it hit the materials section of Nike's production line. Unlike nearly every other Nike jacket I reviewed this jacket uses a polyester and cotton mixed fabric. The addition of cotton provides more breathability and a comforting fit. A raglan sleeve is created when the fabric is extended diagonally in one piece from the underarm to the collarbone. This diagonal seam increases the mobility of your arms and is more anatomically correct than many other designs. The addition of cotton makes a generally low air permeable fabric like polyester more breathable. This makes a jacket with that fabric composition a great choice for any runner. The comfort provided compared to nearly every other running jacket on this list is far superior. This jacket is form fitting and provides a good amount of airflow. You would expect this kind of performance to be reflected in the price but as one of the cheapest jackets featured that isn’t the case. Raglan sleeve construction on this shirt provides your arms with a natural and free range of motions. The addition of cotton to this jacket increases breath ability and comfort. 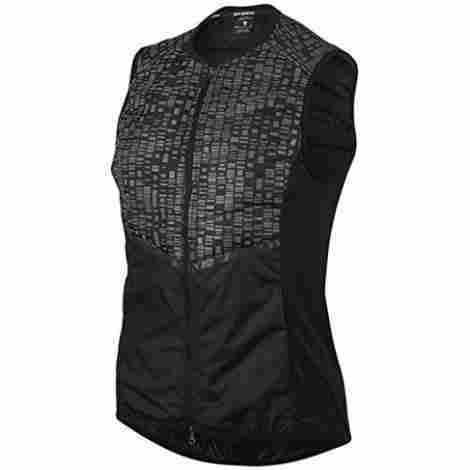 Mesh lined pockets work to enhance the breath ability. A ribbed collar and cuffs give this jacket a bit more durability. This jacket runs long and will likely pass your waistline. For a thinner jacket it has a surprisingly bulky feel. Whether you’re running in a timed event or just want to get the best possible results from your workout a running jacket can greatly affect your performance. They need to find the perfect balance of breathability, comfort, warmth retention, and ease of mobility to provide you with just the right fit to get the job done as quickly as possible. Your arms play a significant role in your daily running. 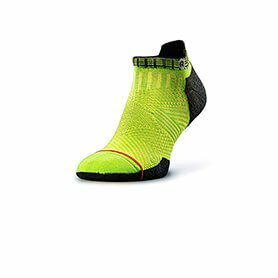 While they may not seem all that important they help to provide balance and the swaying motion gives you a bit of extra force while running. The best jackets need to be capable of moving freely and naturally with your arms and not limit your mobility while running. There’s a reason you don’t see many runners in full-sized goose down winter jackets. Some of the more professional runners won’t even wear a smaller and sleeker jacket. The primary reason is generally the more weight you carry the harder it is to run. This extra weight doesn’t stop at making a more difficult run each extra pound can slow you down by as much as 1 minute per mile. Nike revolutionized running jackets by adding mesh side panels, or rear heat ventilation on most of their running jackets. The ventilation zippers are commonly placed on the sides or rear or the jacket and when opened will allow trapped heat and moisture to escape the jacket. When organizing this list I placed a higher value on those jackets that had this wonderful feature. As one of the most unforgiving but critically necessary elements on the planet the ability to be used regardless of the presence of water is a staple trait of the best running jackets. Without this ability, your jacket will absorb and retain any water during your run making it more difficult due to the added weight. Many of the jackets I selected are waterproof and if they had that capability I gave those jackets a higher value. As somewhat of a confusing design trait a jacket that is waterproof is inherently windproof due to the design. However, a windproof jacket is not inherently waterproof. The reason for this confusing but ultimately important bit of information is that waterproof jackets have a porous inner lining that will prevent the flow of water. Windproof jackets however just use a layering system that will stop wind in its tracks. With this in mind when evaluating these jackets I gave waterproof and windproof jackets a higher value than others and those that were only windproof a slight increase in value. Being that you can find a runner in nearly every climate across the globe I worked to select a diverse array of jackets. I included jackets that would work well in either cool, cold, warm, or hot climates and provide either a refreshing breathability or retain heat and could maintain your body warmth. The type of fabric used in the production of these jackets is a critical aspect that I couldn’t overlook when selecting these jackets. Nike uses almost exclusively 100% polyester fabric in the production of these jackets and for good reason. Polyester is quite resilient, resistant to wear, and slides against itself with ease. Only a single jacket on this list used a different fabric and the only change was the addition of cotton. The addition of cotton provides a breathability that polyester can’t achieve making a more comfortable fabric. One of the most important aspects of conformance is a price comparison between other items on this list and other products with the same purpose as these jackets. When evaluating these jackets I looked at all the features they embody and the materials and type of construction used to produce these jackets. Any jacket that had all the bells and whistles and had a lower price comparatively was placed higher and those with fewer features and a higher price were placed toward the bottom of the list. As one of the more competitive industries, these running jackets need to live up to pre-existing industry standards. While there are no running jackets of America standard guideline to running jackets this is an industry that through competition and out doing the other manufacturers a certain set of minimum features self-regulates the industry. Should a jacket be sub-par it will quickly fall by the wayside and become a forgotten product. With this in mind these jackets needed to be lightweight, form-fitting, provide mobility, and optionally waterproof or wind resistant based upon what is currently offered by other trendsetting products. A small but very necessary addition to many running jackets is the use of a runner-specific hood. While it may seem obvious being vigilant about your surroundings is important while running and if you lose focus or your vision is obstructed due to a standard hood design you will likely end up like me and run right into a stop sign during a normal run. Any jacket that used a running-specific hood was given an increased value compared to those that don’t. People come in all shapes and sizes and vary wildly in both the smaller and larger directions. 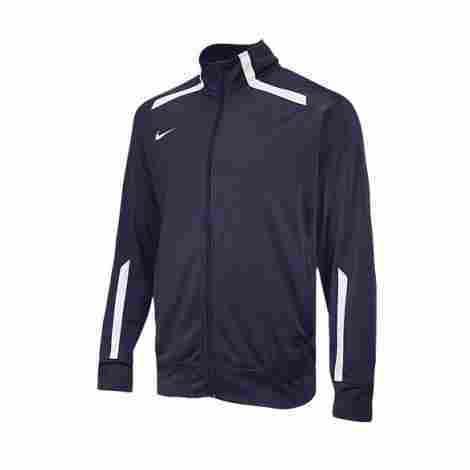 Nike’s jackets accommodate a large variety with sizes ranging from extra small and going up to triple extra large. This sizing spread is substantially larger than many of Nike’s competitors in the running jacket market. More often than not the first tear is a breaking point for a good jacket and it’s all downhill from there. The best step at remedying this is to use fabric that won’t tear easily and will remain structurally intact through its use. 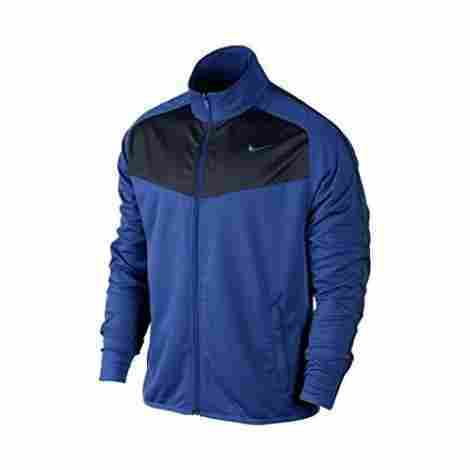 Nike uses most polyester jackets and they are very resistant to tearing or fraying. In addition when combined with cotton as we seen in one of these jackets that durability is amplified. After a long and tiresome run that last thing you will want to do is maintain a running jacket. Whether you need to wash it, dry it, or add a layer of DWR coating the maintenance of a poorly designed running jacket can be bothersome. Each of these jackets is maintenance free and has little to no associated upkeep cost. It’s very uncommon to find anyone in your life that doesn’t use a washer and dryer to clean their clothes and being a modern era it is nearly unreasonable for a manufacturer to require hand washing or otherwise troublesome cleaning approach. Nike understanding that you need this jacket to be as simple to maintain as possible made many of these jackets machine washable. Aside from the potential for injury from falling and the running itself vehicles passing you by, particularly at night, are a source of great risk. The low visibility combined with you having no control over the vehicle make this a serious threat to you while running and doing anything in your power to prevent an accident will go a long way. 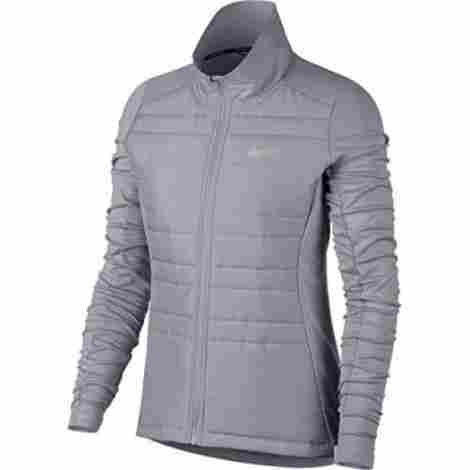 To make your run as safe as possible many of these Nike jackets use reflective liners or half portions of their jackets that will reflect light directly back to its point of origin. Nike is a company that stands behind all of their products, running jackets included, and should you ever believe there to be workmanship flaws you are likely able to use their warranty. Many of their products do have specific warranties so it’s important to always read the labels and assurances before you make a purchase. Any products that featured lifetime warranties were given an increased value during placement. The ability to carry and store a running jacket with ease is an amazing feature and one manufacturer tend to let slip through the cracks when producing their jackets. Personally, I keep a running jacket in the trunk of my car as I only wear it while running. Having a small carrying case can allow you to add or remove this jacket during a run with ease and it won’t take up much space or be difficult to carry. Many of the jackets on this list use a carrying case to help store your running jacket more effectively. The presence of music, while you run, can turn a grueling run into a blissful and enjoyable experience. The ambiance and repetitive beats give you that extra motivation and a drive you can’t get from any vitamin or protein shake. Some of the jackets I featured used a media pouch that could hold your phone or other music relying upon device safely. Additionally one of the jackets went as far as to add an eyelet to funnel your headphones through. This small addition added value to many of these jackets. Q: What size options are available on these jackets? 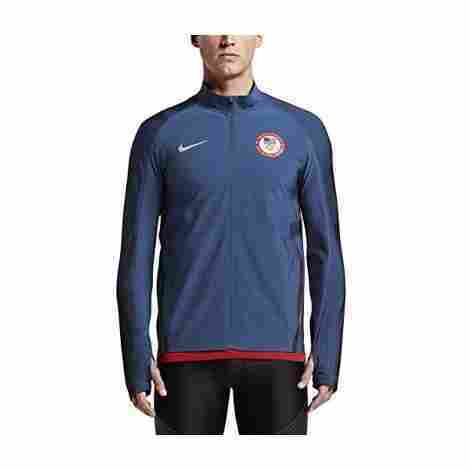 A: In an attempt to accommodate every runner these Nike running jackets have various sizes. From extra small to triple extra large one each of these jackets has sizing options and knowing your size in advance will help during selection. Q: How heavy are these jackets? A: With the weight, you carry having a direct effect on your performance I made the weight of the jacket a key trait I needed to ensure stayed as low as possible. With that being said each of these jackets is below two pounds in weight. Q: Do the pockets have zippers? A: While some of these jackets don’t have pockets and other have pockets but no zippers I sought a few options that had this feature. Five of the jackets on this list use a zippered pocket that will keep your running essentials safe and within reach. Q: Are they machine washable? A: As a critical component in my criteria I selected running jackets that were either machine washable or dry clean friendly. So yes many of these jackets are machine washable. Q: Do they have any interior lining? A: Traditionally these Nike jackets don’t use an interior lining but a few of the options do have one. Q: Do any of these jackets have interior pockets? A: For the safety and protection of some of your more valuable personal items an interior pocket will work to keep them safe and dry. Many of the jackets on this list have an additional zippered interior pocket. Q: Are any of these jackets waterproof? A: With how frequently these jackets will be exposed to water you might think that it would be a natural addition to all jackets however it’s not a standard yet. Many of these jackets are waterproof though and will keep you dry during a standard run. Q: Are any of these jackets reflective? A: Safety was a key focus I had in mind when evaluating these jackets and the addition of reflective surfaces will greatly increase your visible silhouette. Nearly all of these jackets had some type of reflective inset, lining, or another method of increasing your body’s outline. Kalenji, Why Wear Special Running Apparel?